Cell surface proteomics reveals new mTORC1-independent functions of TSC1 and suggests new avenues to develop therapies for TSC1-mutant tumours. Tuberous sclerosis is an incurable autosomal dominant disorder characterised by skin lesions and the formation of benign tumours in multiple organs, particularly the central nervous system. The disease is caused by mutations in the tumour suppressor genes TSC1 (tuberous sclerosis 1) and TSC2, which function in the PI3K/mTOR signalling cascade and are also mutated in some cancers. Class 1 PI3K activation recruits Akt to cell membranes via PIP3, where it is phosphorylated by mTORC2 and PDK1. Activated Akt phosphorylates TSC2, which exists in complex with TSC1. In this state, the GTPase-activating protein (GAP) function of TSC2 is inhibited, leading to the accumulation of active, GTP-bound Rheb and mTORC1 activation via downstream mediators such as p70S6K and 4E-BP1. As such, mutations in TSC1/TSC2 lead to hyperactivation of mTORC1. Everolimus, an mTORC1 inhibitor, is approved for the control of tuberous sclerosis but TSC1/TSC2 mutant cancers are frequently not susceptible to mTORC1 inhibition, suggesting that TSC1/TSC2 mutations might have pro-tumorigenic effects that are mTORC1-independent. 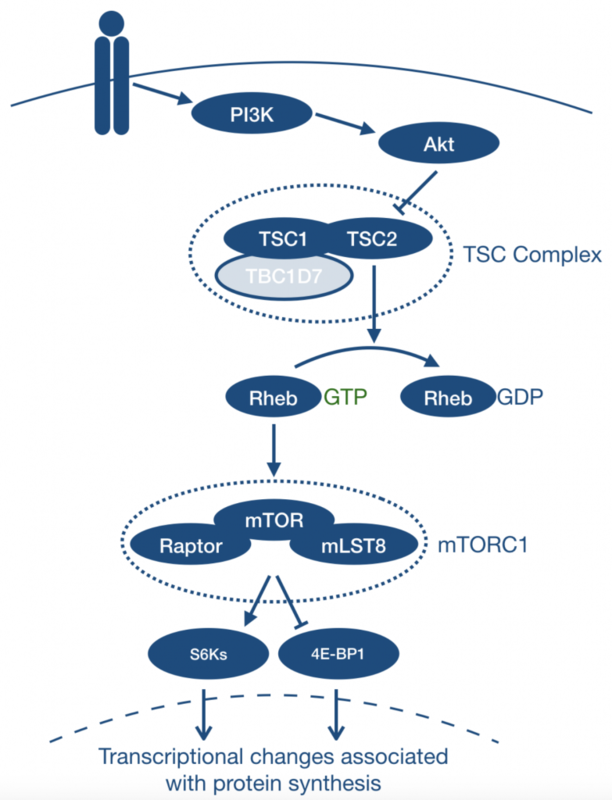 Schematic representation of the role of the TSC complex in mTORC1 signalling. In their preprint, Wei, Leung and their colleagues report a liquid chromatography-mass spectrometry experiment comparing Tsc1-/-mouse embryonic fibroblasts (MEFs) with isogenic Tsc1+/+cells. After stable isotope labelling with amino acids in culture, N-linked glycosylation enrichment allowed interrogation of the cell surface proteome. 20 proteins were identified as upregulated in Tsc1-/-MEFs; reassuringly, these included proteins whose expression is known to be upregulated by mTORC1 activation and multiple proteins involved in cell adhesion, which TSC1 is known to regulate. After flow cytometry validation, the top two hits were neprilysin (NEP) and aminopeptidase N (APN/CD13). TSC1 knockdown by shRNA or deletion using CRISPR-Cas9 led to increased NEP and APN expression in human cancer cell lines. Moreover, suppression of NEP and APN using siRNA led to large reductions in cell line proliferation. Existing inhibitors of these proteins had mixed results: LBQ657, a NEP inhibitor, and bestatin, an APN inhibitor, had no impact on proliferation but a more specific APN inhibitor, CHR2797, was effective through the induction of apoptosis. Counterintuitively, CHR2797 did not affect mTORC1 substrate phosphorylation and APN expression was not reduced by CHR2797 in TSC1-null cell lines, suggesting that TSC1 loss upregulates APN independently of mTORC1 signalling. Combinations of mTORC1 inhibitors and CHR2797 were synergistic, suggesting a novel therapeutic strategy for TSC1-mutant disease. Since Tsc1-/- MEFs do not have higher expression of APN and APN upregulation is independent of mTORC1, these data suggest that TSC1 mutations have effects that are independent of mTORC1. As such, the current strategy to treat TSC-mutant tumours with mTORC1 inhibitors may be insufficient and these might be susceptible to combination therapies. It’s interesting too that TSC2-deficient tumours can respond to checkpoint inhibition so we will have the opportunity to decipher the best combination of inhibitors of mTORC1, inhibitors of these novel targets and immunotherapies over the coming years. The preprint suggests new avenues for basic research as many of the 20 proteins found to be upregulated are poorly understood. It also adds to recent progress on the mTORC1-independent roles of the TSC1/TSC2 complex: both TSC1 and TBC1D7, a third subunit of the TSC1/TSC2 complex that binds to and stabilises TSC1 but is not expressed in all tissues, are tumour suppressors in canonical mTORC1 signalling. However, disruption of their interaction seems to be growth promoting in lung cancer cell lines, supportive of the idea that these proteins participate in other pathways independently of TSC2. To date, TSC1 has been shown to participate in TGFbeta-induced Smad2/3 signalling (and consequently affect the Hedgehog pathway) and TBC1D7 operates independently in insulin signalling. As such, the elucidation of the mechanism by which APN and NEP are upregulated in TSC1-/- cells will be noteworthy. Rosset, C., Netto, C.B.O. 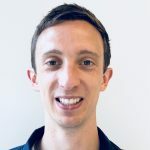 and Ashton-Prolla, P. TSC1 and TSC2 gene mutations and their implications for treatment in Tuberous Sclerosis Complex: a review. Genetics and Molecular Biology, 2017. 40(1): p. 69–79. The authors performed their discovery experiment in MEFs. How significant might species differences be? Might there be additional targetable surface proteins in TSC1-mutant human cells? AGRL2 is mentioned as an upregulated gene that has low expression in normal tissues – could this (or other hits) be a target for CAR T cell therapy in TSC1-mutant disease, independently of the success of small molecule inhibitor-based approaches? Thanks for taking the time to highlight our work. Q1. This is an important point. We chose to study MEFs as complete TSC1 knockout cells already existed, and were previously studied to glean important insights about the biology associated with TSC1/2 loss and mTORC1 signaling. While APN and NEP are both upregulated in human cell lines due to TSC1 loss, it is possible that there are human-specific targets associated with TSC1 that our proteomics screen did not capture. We are planning proteomics experiments in human bladder cancer cell lines isogenic with respect to TSC1 expression to address this question. Q2. Certainly this is a possibility, assuming potent and selective monoclonal antibodies can be raised to an extracellular epitope. AGRL2 is also a GPCR, so small molecule agonists or antagonists could also have bioactivity. We are conducting further studies to understand the role of AGRL2 expression and/or activity to the survival of cells with TSC1 mutations.